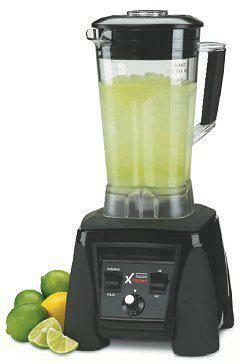 The Waring Commercial Xtreme 3.5 HP Programmable Blender MX1500XT is the most advanced model available in this series. If you have checked out the Waring Commercial Xtreme Model MX1300XT, you have basically already gotten familiar with this MX1500XT model. The only difference is you get an accessory to keep the noise down in your home: a sound enclosure. This attractive blender packs 3.5 HP at maximum performance and is designed to stand up to the demands of high traffic commercial use. That means it will last an impressive length of time sitting in your residential kitchen, even if you like to whip up smoothies, sauces, and frozen drinks on an almost daily basis. The Commercial Xtreme blender series is extremely popular because of the power it packs along with commercial grade, heavy duty parts that are also dishwasher safe. 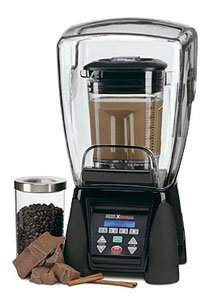 Add the sound enclosure that comes with the Waring Commercial Xtreme 3.5 HP Programmable Blender Model MX1500XT, and you have a monster on your hands. 45,000 rpm's (bare motor speed). Great for soups, salsas, sauces, deserts, dressings and beverages. Easy to clean electric membrane keypad. LCD display with Blue Back light for easy viewing and program selection. One piece dishwasher-safe removable jar pad. 64 oz. Poly carbonate Container. Limited Three Year Motor Warranty and Two Year Parts & Labor Warranty. Limited thre year motor warranty. Two year parts & labor warranty.